Modern Main Floor Suite with Private Entrance. Backs on to Mineral Creek in small forest setting for relaxed setting; Full Size Kitchen, Three Piece Bath with full size tub, Lots of closet space; All new Stainless Steel Appliances & Underfloor Heating. People who stay with us love the fully equipped kitchen, the 60" TV with hundreds of channels, the pillow top queen bed and of course the professional cleaning and sanitizing that we pride ourselves on. Check in time is 4pm, Check out is 12 noon. My partner and I have returned to the Sea to Sky corridor in 2015 and love it so much we want to share it with others. Jennifer and I enjoy motorcycling, star gazing and exploring the surrounding beauty of our home then returning home to cuddle up and enjoy a movie. Our style of hosting is to be helpful but not intrusive, we want you to feel welcome and enjoy your stay. Our VRBO business is built on giving you a memorable stay and having you come back and refer others. Walking distance to Britannia Beach Mine Museum, minutes from Murrin Provincial Park & Stawamus Chief Provincial Park for the climbing and hiking enthusiast. Minutes from world famous Golfing in Furry Creek of Happy Gilmore fame. Downhill Mountain Biking enthusiasts will appreciate close proximity to Mount Garibaldi Park and of course you are 40 minute drive from Whistler Village, 40 Minute drive to North Vancouver and easy access to the Lions Gate Bridge/Stanley Park. Suite has access to private yard that has a small creek running through the back of it. After a walk along the ocean, grab a hammock and a book and relax creek side while staying. Small fires are permitted at night (subject to local seasonal fire ban) for the camping experience then retire inside to a modern suite with Full Kitchen and Bath, Top Grain Leather sectional and 60" TV with access to premium movies, Movie Time, Super Channel and Netflix. Free wifi so you can choose to stay in touch. Full size bathroom, underfloor heat and first aid kit provided. Howe Sound is within easy walking distance of the suite and ocean views are available from the front of the house. Britannia Beach was founded in late 1800's and started copper production in 1900. The town holds on to its history while slowly updating into the present day making it unique. Britannia Beach has a rugged coastline with large tide swells. The Sea to sky Highway that offer a variety beaches; Furry Creek, Porteau Cove, Lions Bay, Horseshoe/Whitecliff Park. The property sits between Sheer and Sky Pilot Mountain. 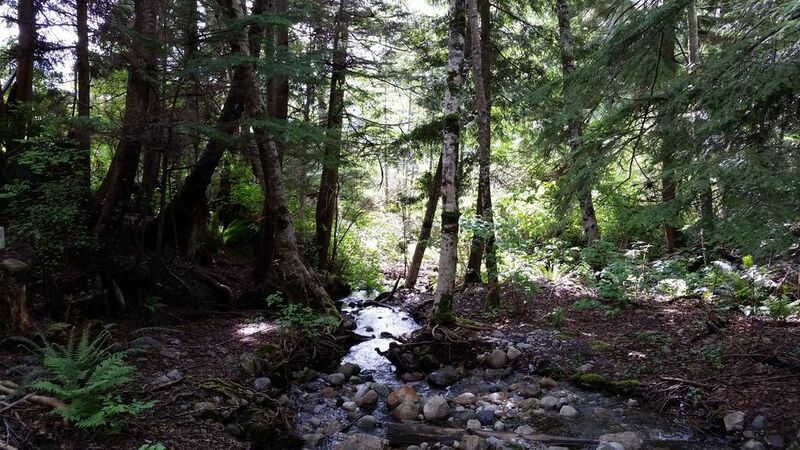 Our Property backs on to a small creek that runs year round. The creek is fed from Sky Pilot Mountain and is soothing in summer/winter and turbulent in Spring & Fall. Stainless Steel, full size fridge with water and ice in the door. Fully stocked and modern kitchen, all stainless steel appliances, pots, pans, full sets of glassware, plates and utensils. Full cable package with 8 premium movie channels, HBO and Netflix. See Playstation for DVD & Blueray playback. Located on Upper Crescent in a former mining community, there is rich history and host of things to explore. Your backdrop is Mount Sheer and Sky Pilot Mountain and below the sea and Howe Sound. Many television and movies are shot in the town and surrounding area because of the breathtaking settings and early 19th century charm. It is not uncommon to see filming taking place in the community, who knows you could be an extra in the next big block buster! Suite has access to private yard that has a small creek running through the back of it. After a walk along the ocean, grab a hammock and a book and relax creek side while staying. Small fires are permitted at night (subject to local seasonal fire ban) for the camping experience then retire inside to a modern suite with Full Kitchen and Bath, Top Grain Leather sectional and 60" TV with access to premium movies, Movie Time, Super Channel and Netflix. Free wifi so you can choose to stay in touch. It was fabulous...the unit itself was top shelf...our hosts did a terrific job and we could not think of anything they could have done any better. Nice job and thanks. It was a perfect location in a beautiful area that was just the right fit for our needs. The hosts were great. A great initial introduction to the suite, and then lots of privacy to enjoy our stay. Everything was perfect. The suite looks brand new, and is very well equipped. They’ve thought of it all there. We’ll definitely be back again. Thank you for everything! My friend and I stayed in the Creek House suite for our "vacation in your own backyard" holiday. We found Jennifer to be warm and engaging and both Rod and Jennifer to be very helpful when we had any questions. The suite was well designed, well laid out and very clean. All amenities noted on their listing were available, higher end quality and in good order. The location in Britannia Beach was central to all our activities in the area and inquiries about local activities and eating/drinking establishments were knowledgeable and spot on. We thank both Jennifer and Rod for allowing us to stay in their suite and look forward to another stay in the future as we found there to be more to see and do then we had time for on this trip. One of the nicest VRBO properties we've ever stayed at. Rod & Jen have created a fist class place to rest and relax along the Sea to Sky Highway. Everything was perfect! Located on Upper Crescent in a former mining community, there is rich history and host of things to explore. Your backdrop is Mount Sheer and Sky Pilot Mountain and below the sea and Howe Sound. Many television and movies are shot in the town and surrounding area because of the breathtaking settings and late 19th to early 20th century charm. It is not uncommon to see filming taking place in the community, who knows you could be an extra in the next big block buster! Local boat launching and berthing in Britannia or Squamish is available (check with harbor master in advance).